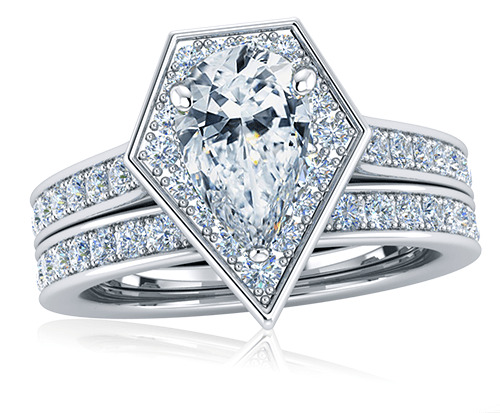 The Marvela 2 Carat Pear Cubic Zirconia Pentagon Shaped Halo Cathedral Wedding Set features a solitaire engagement ring in a unique styled design with a five sided geometry inspired frame around a 10x7mm diamond look pear. 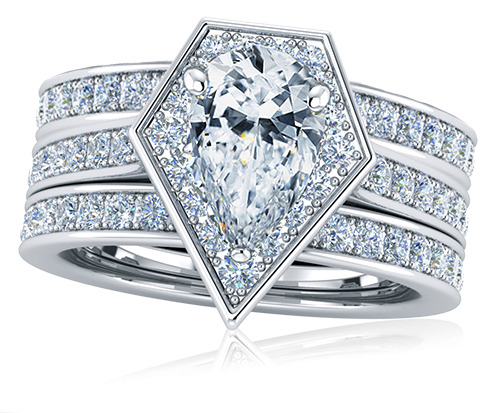 The prong set pear is perfectly surrounded by a halo of prong set rounds that further enhance its beauty and gives the illusion of a larger center making it the main focal point. The shank sweeps up with cathedral sides that have prong set rounds that line down three quarters of the way down. 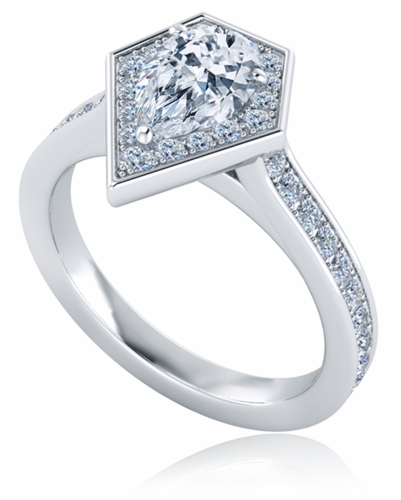 The matching band mimics the same prong set round styling as the engagement ring and fits flush up against the solitaire for a seamless look. 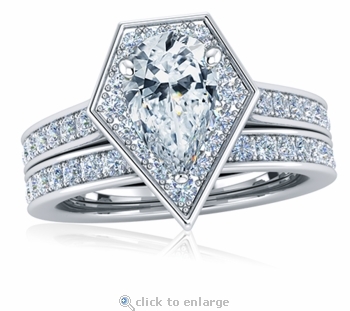 The halo measures approximately 15-16mm in overall length. 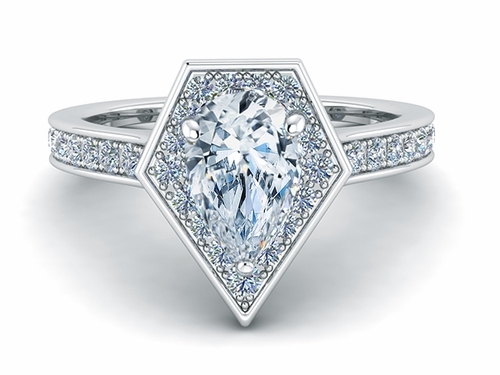 The center stone is available in various color options that include man made ruby red, sapphire blue or emerald green gemstones in addition to lab created canary diamond look yellow, pink diamond look or white diamond look cubic zirconia. 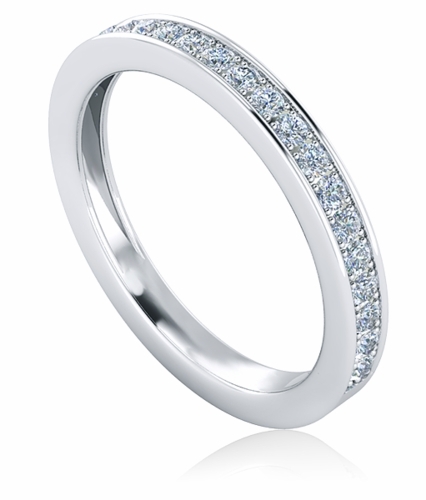 Choose from 14k white gold, yellow gold or rose gold in addition to 18k white or yellow gold or luxurious platinum. 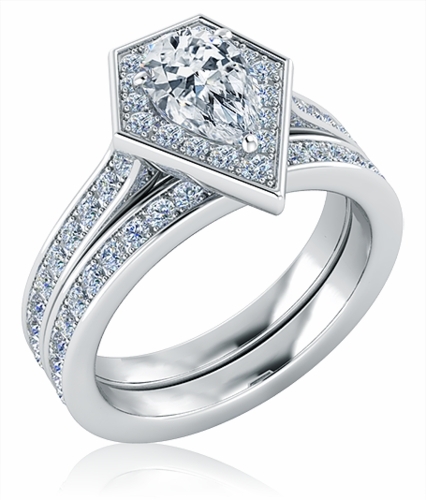 This wedding set is also available in different carat sizes and diamond shapes. Please call us directly for a quote. A matching pendant is also available, please see item P2117. For further assistance, please contact us directly at 1-866-942-6663 or visit us via live chat and speak with a knowledgeable representative.